Following on from my post last week on having a hat made by Brent Black, here is a little background on the craft involved in making them. Next week we’ll move on to the fitting process. The making of a hat begins with the farming of cogollos: long stiff green spikes of plant that, if left to mature, will open up into a spread of palm leaves about a metre wide. The straws that the weaver wants are the youngest, most undeveloped leaf shoots in the centre of these spikes. To get to them, he must first pick the right cogollos (at the right point of development) and then peel back the tough outer layer and a few tougher shoots, revealing a long, pale-coloured fan in the middle. Even the edges of this accordion are a little too tough, and so he uses the tip of a deer antler to slice them off, leaving a few dozen long, tender strips to work with. Although pale, the strips (tallos) are still definitely green, vegetal and leaf-like at this stage. It is only several stages of sulphur application, including two smokings and a lot of beating, that give the hat the creamy colour we associate with panamas. First, though, they must be boiled: curled up into a black pot and stirred over a fire. Thus cooked, they are hung up outside the houses – on washing lines if the sun is not too strong, otherwise in the shade. As many of the houses in Montecristi are on stilts, they can even be hung up underneath. Next, one of the more unhealthy stages of panama hat-making. The tallos are placed in a white wooden box – similar in size and structure to a bee hive – and burning sulphur placed underneath it. Hot coals keep the sulphur smoking and it runs up through the box, bleaching the straws to the colour we readily associate with panama hats. The actual weaving of a hat begins with the creation of a small cross of four pairs of straws, which are then interwoven on the fingers of a weaver and gradually expanded with the addition of more straws to create the plantilla – the circle that forms the top of the hat. You can always tell a weaver’s hands because he has long, carefully maintained thumbnails. 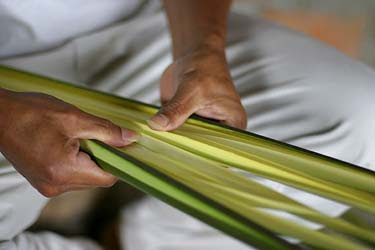 They are used to split the straws prior to weaving, creating exactly the right thickness and length. Then the other unhealthy bit. When the plantilla is as big as the top of a hat, it is placed on a wooden block or form, which sits on a wooden platform at about waist height. The weaver bends over and places his chest on top of the block, holding the hat in place as he continues to weave the hat around the edges, bending the edge down over the wooden form. Those extended periods of pressure on the chest are not good for weavers, but thankfully there is more awareness than there once was and they take regular breaks. When the crown is big enough and it’s time to start weaving the brim, a leather strap is tied tightly around the bottom of the hat. 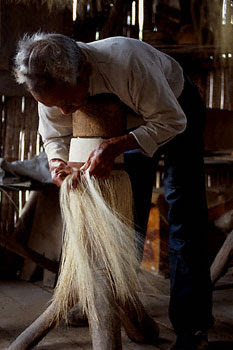 The weaver then starts weaving outwards and, when he is finished, leaves five or six inches of excess straw around the edges. 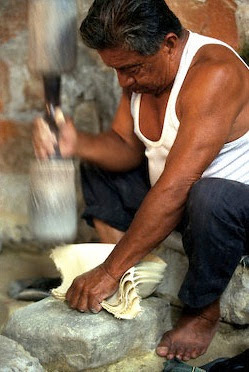 He does not finish the brim; that is the job of a rematadora, a specialised job that involves weaving the straws back again, towards the crown, in order to create a loose band around the outside. Even the final tightening is done by someone else, the azocador. And the cortador trims off the loose ends. After washing and bleaching (more sulphur), it’s over to the apaleador to pound the hats with a wooden mallet, to soften them. The apaleador’s job is my favourite. It is his strong-armed work that produces the characteristic colour of the panamas we know, as he hammers them and regularly sprinkles sulphur powder on and between the hats. The contrast between the delicate weaving and the brutal force of the apaleador is striking. 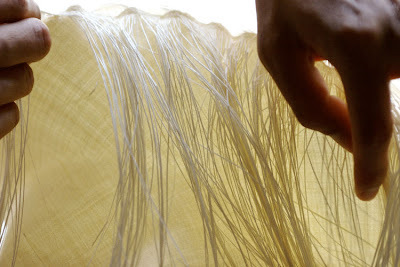 It also shows how fragile raw materials can be woven into something that is pliable and strong. Brent and his colleagues in Montecristi pick the hats they want, going for a range but always including the very best few. Brent then blocks them all himself in Hawaii, which is almost as admirable a craft as the weaving. It’s what creates the perfect fit, which if you have a long, large head like me, is a godsend. More on the technical side of blocking, perhaps, another time. In the next post we will look at how Brent’s fitting process by post works. You can follow the discussion on How panama hats are made by entering your email address in the box below. You will then receive an email every time a new comment is added. These will also contain a link to a page where you can stop the alerts, and remove all of your related data from the site.